This year’s Homeless World Cup took place in Milan from the 6th to the 13th of September. Ukraine were crowned this year’s champions after defeating Portugal 5-4 in an exciting final. INSP staff Lisa Maclean and Maree Aldam spent 4 days at the event and met with representatives from 11 INSP street papers, who were there with their teams. Lisa and Maree also had meetings with 15 other individuals, to offer support for new or emerging street paper projects and promote the street paper concept. Former SNS intern Danielle Batist was also in Milan as a freelance journalist and she covered the event on behalf of the Street News Service while she was there. You can see her blog here. Lisa and Maree also attended several VIP events with HWC staff, partners and sponsors. Maree also presented the INSP Networking Trophy – won this year by Belgium. INSP was delighted that the final of this year’s Homeless World Cup featured 2 teams managed by street papers. Ukraine (managed by The Way Home, Odessa) defeated Portugal (Managed by CAIS, Lisbon) by 5 goals to 4 in the exciting final. Narrowly missing the final was Brazil, managed by the street paper OCAS – they came 3rd overall. The event ended with a distinctly Brazilian flavour as samba drummers celebrated the formal handing over from Milan to Rio de Janeiro for the 2010 Homeless World Cup. Check out the lively Brazilian team giving the crowds in Milan’s Duomo Square a taste of what’s to come at next year’s event – click here. 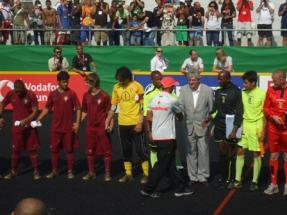 Mel Young, President, Homeless World Cup and Former INSP Honorary President, closing the competition said: “Congratulations to the players. Your spirit of fair play, courage and determination is a true example to the human race”. Click here for INSP’s gallery of pictures and click here for more pictures from the Homeless World Cup. Read our annual reports to learn more about our impact over the past few years. INSP has launched a new initiative to help support street paper members situated in the US, Canada and Mexico. The North American Bureau will be led by the former executive director of Street Roots and backed by Seattle street paper Real Change. This year we asked vendors: if you could give a song as a present this Christmas, what would you choose? The result was the INSP Vendor Playlist, which is now available for your listening pleasure. In the final instalment of this series, Zebra vendor Happy talks about his love of gospel music. This year we asked vendors: if you could give a song as a present this Christmas, what would you choose? The result was the INSP Vendor Playlist, which is now available for your listening pleasure. The street paper Z! is sold in Amsterdam. Four of its vendors spoke about their contributions to the playlist. This year we asked vendors: if you could give a song as a present this Christmas, what would you choose? The result was the INSP Vendor Playlist, which is now available for your listening pleasure. Three Tagessatz vendors explain why they made their contributions. This year we asked vendors: if you could give a song as a present this Christmas, what would you choose? The result was the INSP Vendor Playlist, which is now available for your listening pleasure. Trott-War vendor Peter chose a song that stands out from the surrounding pack – a rap song about the German football association. This year we asked vendors: if you could give a song as a present this Christmas, what would you choose? The result was the INSP Vendor Playlist, which is now available for your listening pleasure. A bunch of StreetWise vendors in Chicago explained in depth about their contributions. This year we asked vendors: if you could give a song as a present this Christmas, what would you choose? The result was the INSP Vendor Playlist, which is now available for your listening pleasure. Seven Surprise vendors chipped in with their choices. This year we asked vendors: if you could give a song as a present this Christmas, what would you choose? The result was the INSP Vendor Playlist, which is now available for your listening pleasure. Today, we hear Strassenkreuzer vendors Georg and Brigitte on The Velvet Underground and Tony Marshall. This year we asked vendors: if you could give a song as a present this Christmas, what would you choose? The result was the INSP Vendor Playlist, which is now available for your listening pleasure. Street Sense vendors in Washington DC talk about their song choices, which range from festive classics to T-Pain. INSP Vendor Playlist: Street Roots vendors share the stories behind their selections. This year we asked vendors: if you could give a song as a present this Christmas, what would you choose? The result was the INSP Vendor Playlist, which is now available for your listening pleasure. Street Roots vendors in Portland, Oregon, run through their choices. This year we asked vendors: if you could give a song as a present this Christmas, what would you choose? The result was the INSP Vendor Playlist, which is now available for your listening pleasure. Kine, a Sorgenfri vendor and a musician, is inspired by Damon Albarn, musical polymath and the brains behind animated band Gorillaz, in both her music and her life. This year we asked vendors: if you could give a song as a present this Christmas, what would you choose? The result was the INSP Vendor Playlist, which is now available for your listening pleasure. Shedia vendors Irini and Magda have contrasting reasons behind their song choices. This year we asked vendors: if you could give a song as a present this Christmas, what would you choose? The result was the INSP Vendor Playlist, which is now available for your listening pleasure. Scarp de’ tenis vendor Claudio reminisces about the Italian countryside through his favourite song of all time. This year we asked vendors: if you could give a song as a present this Christmas, what would you choose? The result was the INSP Vendor Playlist, which is now available for your listening pleasure. One Step Away vendors in Philadelphia are like a microcosm of the entire street paper network – they have diverse musical tastes. This year we asked vendors: if you could give a song as a present this Christmas, what would you choose? The result was the INSP Vendor Playlist, which is now available for your listening pleasure. Mi Valedor vendor Erasmo talks about his love of singer José José and how it links with a lifetime of struggling with alcoholism. This year we asked vendors: if you could give a song as a present this Christmas, what would you choose? The result was the INSP Vendor Playlist, which is now available for your listening pleasure. Megaphon vendor Stephen is a musician himself, and believes that his songs are perfect for Christmas.